In three short parts (audio only) Rupert Sheldrake, scientist, explains his extensive research into the "normal" telepathic faculties of humans and animals. So, kick back, do your nails, clean out your desk drawer or just put your feet up relax and listen. And although you might think this is new research, it isn't. The Research and "development" of Remote Viewing (ie. Clairvoyant Telepathy) at Stanford University California Research Institute 1972-1985 let out a Prime Time Television Special whereupon the military secret research and usage of psychic warfare was announced and explained regarding the National Military' "University" experiments for the government. The Televised Special was aired in 1996 and I sat watching it and understanding that these projects had been going on since before my birth. I have lightly kept up with and followed the work of Ingo Swan, Hal Putof and the people on those teams every since. clairvoyant visions the Virgin Mary, Moses, Jesus, Buddha and any other so called enlightened saviors and saints have claimed. So really now . . . isn't it time we got with the program? The California State University in Irvine is currently conducting test research and experimentations as I write this in April 2012, on volunteers and on unknowing volunteers. The American-Russian "Psi Race" is over now, or is it? Of course telepathy is real! It has been openly displayed as a real phenomenon by people from all walks of life throughout history but . . . there is a severe taboo put on it for any common population and they manage to KEEP that taboo on, all whilst exposing their research AND development of it. Religions continue to pooh pooh it with a warning eye no matter how much telepathic contact and clairvoyant visions the Virgin Mary, Moses, Jesus, Buddha and any other so called enlightened saviors and saints have claimed. So really now . . . isn't it time we got with the program? The California State University in Irvine is currently conducting test research and experimentations as I write this in April 2012, on volunteers and on unknowing volunteers. The American-Russian "Psi Race" is over now, or is it? Telepathy can be facilitated with the common everyday mind. The research on this has long ago been completed. Whether we use it or not can no longer be criteria for proof or disproof. It's used regularly and potently all around us every day. 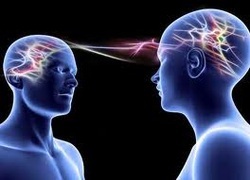 And now, "electronic telepathy" is used to reach those people who can not or will not access their telepathic faculties has hundreds of websites and you-tube videos screaming of unfairness to targeted individuals. I can't resist here this old saying, "If you are going to be an Ostrich and stick your head in the sand on this one, you are going to get your behind kicked and you will not see it coming." It's the next wave. It is gathering speed. It has been out in the open, even in this taboo supressed current society since at least 1996. Here is some of what was aired back then, how it was developed and how it is used. Take a look . . . and I then will quit HAARPing on it. After all, everybody is talking about it already. Interestingly, the "natural" and normal telepathy between mothers and their babies, animals and their young, animals with each other, animals with humans and so on should have been enough all along in human history to verify that telepathy was a normal faculty of earthly consciousness. Everything wittnessed after this was simply demonstration that this faculty could be honed, amplified and brought up in power and extended usage. And of course, could also be suppressed. Strangely, in 1996, they wanted everyone to know about it. It's a very big world, isn't it? "soft science" yields just as much fruit as "hard science" and there is no true loyalty to "hard science" by scientists as is often implied. Did you enjoy this article? Hmmm? Buy me a cup of coffee! CLICK TO BUY SWAN A CUP OF COFFEE!